Mars as seen by NASA's Viking mission. NASA is closer to putting boots on Mars than it's ever been before, the space agency's chief says. NASA Administrator Charles Bolden, a former space shuttle commander, said he envisioned becoming the first person to explore Mars when he checked in for astronaut training at Houston's Johnson Space Center in 1980. 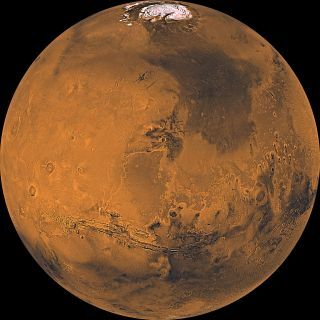 "We are farther down the path to sending humans to Mars than at any point in NASA's history," Bolden said Thursday (Sept. 17) during an event at NASA Headquarters in Washington, D.C. that detailed NASA's manned Mars plans. NASA Deputy Administrator Dava Newman and Jim Green, director of NASA's planetary science division, also took part in the discussion, which was webcast live on NASA TV. So did a number of NASA researchers, as well as Andy Weir, author of the sci-fi novel "The Martian," which has been made into a movie starring Matt Damon that opens on Oct. 2. "We have a lot of work to do to get humans to Mars, but we'll get there," Bolden said. Some of this work includes developing a capsule called Orion and the Space Launch System (SLS) megarocket to help get astronauts to deep-space destinations. Orion and the SLS are scheduled to fly together for the first time, on an unmanned test flight, in 2018. Newman cited the fact that astronauts recently grew (and ate) lettuce on the International Space Station, as part of an experiment designed to better understand the production of food crops away from Earth. Furthermore, two crewmembers on the orbiting lab — NASA astronaut Scott Kelly and cosmonaut Mikhail Kornienko — are halfway through an unpredecented yearlong mission that is characterizing the pyschological and physiological effects of long-duration spaceflight. Such work should inform planning for crewed Red Planet missions, which could take astronauts away from Earth for 500 days or more, NASA officials have said. Newman also mentioned the Mars Oxygen ISRU Experiment (MOXIE), one of seven science instruments that NASA's next Mars rover will carry toward the Red Planet when it blasts off in 2020. "We're going to make oxygen on another planet — the first time ever to make oxygen on another planet," Newman said. "These experiments — they're real, they're here." Such work is being done in service of an epic and monumental goal. "[Putting] boots on Mars is possibly the most exciting thing humans will ever do," Bolden said. "We have been engaged in getting to Mars — getting humans to Mars — for at least 40 years, beginning with the first precursors," he added. "I have no doubt that we can accomplish what we have set our minds to do."